Show Me Clarks! Ilkeston Shoe Shop Bags Clark’s Shoe Contract. Ilkeston footwear shop ‘Show me Shoes’ is expecting to increase shopping back into the town centre and boost the local economy after securing a contract to officially stock Clarks shoes in the town. 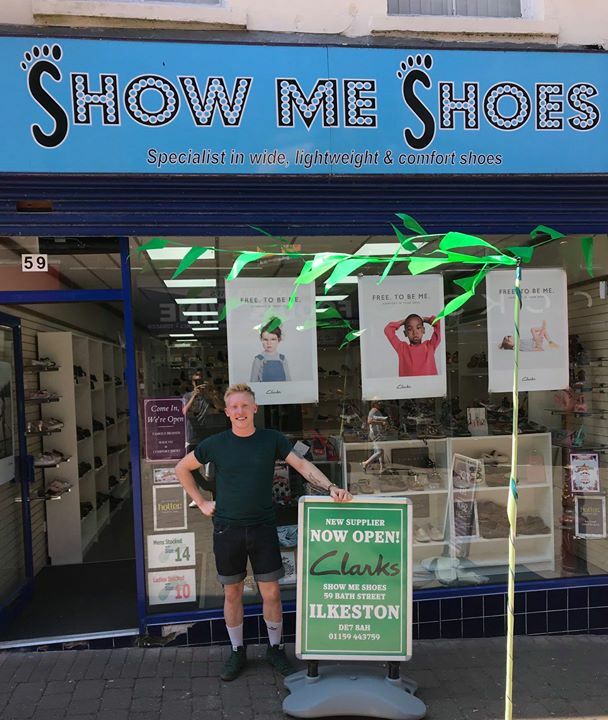 Show me Shoes, located on Bath Street will be the only official stockist of a range of Clarks shoes in the Ilkeston area, after Brantano’s fell into liquidation in 2017 and the former store located in the old Co-Op building ceased trading in 2013. Show Me Shoes will begin stocking a range of Clarks shoes immediately ranging from babies first shoes, first walkers, junior and senior school sizes and all will be available in men and women’s styles and sizes. Staff in store have been fully trained and accredited with fitting Clarks shoes in the UK. Show Me Shoes has shops located on Bath Street Ilkeston and Westgate in Mansfield, they stock a wide range of shoes from brands such as Hush Puppy, Joe Browns, Hotter and will begin stocking Clarks immediately.